You can’t play soccer with a football, and you shouldn’t play viola with a converted violin. V Richelieu violas offer a uncompromising instrument that resonates with a true viola sound. Featuring hand-applied oil varnish, master craftsmanship, and true viola patterns all the way down to the fractional sizes, Richelieu violas are built for the alto clef aspiring soloist. Don’t compromise. Play Viola. Play Richelieu. V. Richelieu fractional violas are available for purchase starting at only $3200 for purchase and for rent as little as $43/month! How is a Richelieu viola different than other fractional violas? Our violas are designed to provide young, passionate violists with an instrument that is a fractional viola, not a modified violin. The wider lower bouts draw out more sound and depth for the lower end of the range than the more common Strad pattern. The slightly shorter string length is proportional to a 16” viola string length rather than a full-size violin. All of this leads to a true viola sound, all the way down to the 11” viola and up through our robust 16” viola. Don’t just take our word for it! 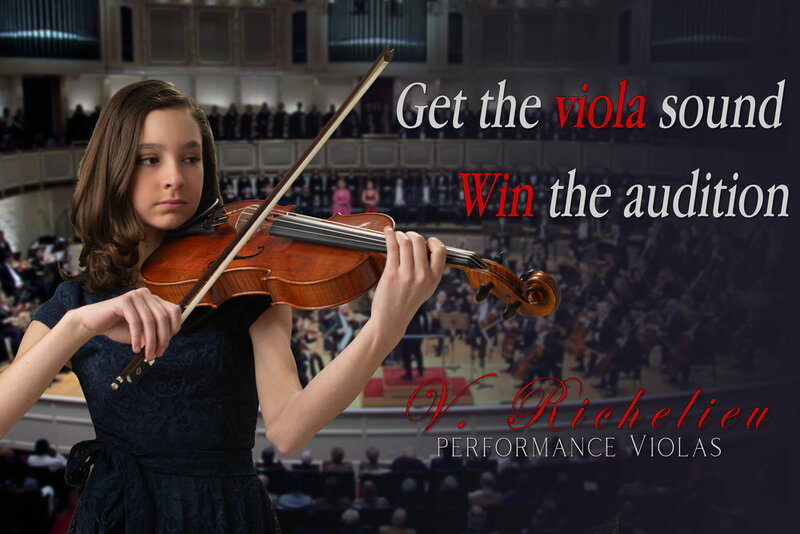 Try out a Richelieu viola and see the difference for yourself. More information on our violas is headed your way!